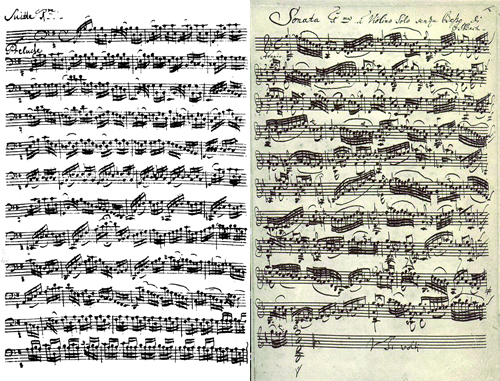 UNCOVERING A MYSTERY: Why do the six suites for unaccompanied cello (left) sound so different from the sonatas and partitas for solo violin (right)? Both have historically been attributed to J.S. Bach. But new evidence shows that Bach’s second wife Anna Magdalena may have composed the cello suites. The reproduction of the cello suite no. 1 above is from the historical edition in Anna Magdalena’s own handwriting. Johann Sebastian Bach is often referred to as the father of Western music. And as a composer, Bach looms large in the minds of just about every musician I have ever met. Therefore, any suggestion that things might not actually be the way we have come to understand them is not likely to be greeted with great enthusiasm! But it may be time for a serious upheaval in our understanding of who composed Bach’s works. In my book “Written by Mrs. Bach,” (HarperCollins/ABC Books, see www.bit.ly/BachBook), I describe my attempt to uncover the origins of the six cello suites and other works long attributed to Bach. My search for the truth has taken me on a great and rewarding adventure, including a deep foray into a field of scientific investigation called forensic document examination, which is the study of documents and handwriting for the purpose of demonstrating authenticity. The results are astonishing. Because space is limited, what I have written here is merely a summary of the journey from my early suspicions that all was not right, to how I reached my conclusions. My first experience of playing the music of Johann Sebastian Bach was when I began studying Bach’s A-minor violin concerto in my early teens. Later, I won a scholarship to study at the Welsh College of Music in Cardiff with Garfield Phillips, the concertmaster of the BBC Welsh Orchestra. I still remember my lessons with Professor Phillips, where we worked on Bach’s unaccompanied violin sonatas and partitas. He marked up my music with a green ink fountain pen – a very unusual habit! In 1971, I won a place at the Royal Academy of Music, where I studied violin with the highly respected violinist and teacher Clarence Myerscough. At the same time I also studied viola with Winifred Copperwheat. Professor Copperwheat was only four feet ten inches tall, and I am six feet one inch tall, so I literally towered over this wonderfully insightful and very great musician. Immediately after I began my studies with Professor Copperwheat, she instructed me to obtain a copy of the six cello suites of Bach, arranged for viola. She was very specific about the edition I was to purchase; she wanted me to get the Lifschey edition, not the Svenky. What I was not aware of at the time was that in the case of the cello suites, there was a very significant reason for Winifred’s insistence. I was to learn soon that there was no manuscript of the cello suites in Bach’s own hand, and so every editor of the suites (whether for viola or cello) has made decisions about the bowings, and indeed even some of the notes to be played. These changes were necessary, Winifred informed me, because the only complete manuscript of the suites was in the hand of Bach’s second wife, Anna Magdalena, and it was, according to tradition, full of inaccuracies and all but illegible. It is important to know that the matter of the differing editions is very significant indeed. Cellist Dimitry Markevitch, editor of a 1964 edition of the suites and discoverer of the so-called Westphal manuscripts, claimed that he had 61 editions of the six cello suites in his library and stated that there have appeared, since the first printed edition, some 93 editions or versions of the suites. It must be stressed that these different editions vary substantially one from another. The cellist Uzi Wiesel says that this caused a veritable mishmash of stylistic interpretations when he attended a series of performances in Paris in the 1990s. Further, Wiesel was most critical of those who played the suites using only Anna Magdalena’s manuscript as the source. This begs a very interesting question: why does Anna Magdalena’s manuscript, as Wiesel says in his review, sound “strange to my ears”? It is worth pointing out that the chamber music of Bach was not published during his lifetime, and it has been said that it was composed for domestic consumption or performance. So the cello suites are most likely to have been written for someone within the household, rather than an outsider – which is the traditional view, of course. As well as the undated Anna Magdalena version, there are two anonymous handwritten copies of the suites from the later 18th century, plus a version written out by Johann Peter Kellner, one of Bach’s most important copyists, with a suggested date of 1726. Let’s return to my early lessons at the Royal Academy of Music in London. The following week, I duly turned up to my viola class with the Lifschey edition. As soon as I began to play the prelude, I was struck by the vast differences between the two sets of music I was studying: the unaccompanied violin sonatas and partitas on the one hand, and the cello suites on the other. Visually, the violin works appear complex and intellectually very challenging. By comparison, the prelude of the first suite appears to be rather simple, at least on the surface. I immediately became certain that I what I was playing was not written by the same person. However, I tried very hard to believe that J. S. Bach was, in fact, the composer. As I practiced the suite, I diligently applied all my knowledge and prior experience of Bach as I worked away at the music. But try as I might I could not feel at ease. Despite the fact that over the ensuing four years I studied all the movements of some of the cello suites and some movements from others, the thought would not go away. There was something wrong with the sound and the structure of the music, but I couldn’t put my finger on it. I took heart from that story. Winifred also explained to me that the suites were not performed much, if at all, in concert during the 19th century. As I found out much later, this may be because when they were first published in Paris in 1824, they went under the title “Six Sonates ou Etudes Pour Le Violoncelle Solo” – technical studies for cello! The idea that they were etudes would undoubtedly have led to the perception that they were lesser music. Even the great 19th-century composer Robert Schumann considered them to be musically incomplete, so he added a piano accompaniment! Finally, Philipp Spitta, the most significant 19th-century biographer of Bach, acknowledged the very different character and proportions of the cello suites, but attributed the difference to what he considered the cello’s limited expressive quality. All of these reasons may have contributed to the fact that cellists apparently abandoned the suites at that time and why they were not considered an important part of the cellists’ repertoire. After leaving the Academy in 1975, I first worked as a freelance player with the London Mozart Players and other London-based orchestras before taking up a position with the Halle Orchestra in Manchester. This group was very busy performing all over the world, so there was plenty of time to talk with colleagues about many musical issues, including the cello suites. The cellists I spoke with had various opinions on the subject. Some believed that the suites were difficult to interpret because there had not been a continuous history of performance, unlike the violin sonatas and partitas. Others believed it was because the suites were not composed by a cellist. Some thought that they were written much earlier than the violin works by a very young J. S. Bach, and this was why they are musically simpler. A powerful question kept rattling around in my brain. Was is it possible that the cello suites were not actually composed by J. S. Bach? In 2000, Bärenreiter published a new edition of the suites as part the commemoration of the 250th anniversary of Bach’s death. The edition included a facsimile of the Anna Magdalena manuscript of the suites. I was quite stunned by what I saw. The music calligraphy was very beautiful, precise and elegant, and not at all hard to read. I immediately became convinced as I looked at Anna Magdalena Bach’s supposed “copy” of the cello suites that this was not a copy of someone else’s music – but her own. This was mainly because the music calligraphy appeared to flow easily and to be very self-assured, which is consistent with someone writing out material with which they are very familiar. At the same time it lacked any sense of the slowness of execution that would be consistent with someone working to accurately copy from another source, especially if they are trying to mimic the music calligraphy of the original. I began the slow process of comparing the cello suites with the violin sonatas and partitas. This involved painstakingly deconstructing both sets of music by analyzing the harmonies used. I examined the movement structures of the suites and aligned them with the movement structures of the violin partitas. The first thing that stood out to me was the apparent symmetry of the suites, when compared to the very non-symmetrical partitas. Was this just a coincidence, or an exception – or was this something important? I needed to find out. By the end of 2002 my structural and musical analysis of the cello suites had revealed 17 reasons why they did not musically match any other work of J.S. Bach’s in the same genre. But it was the use of the science of forensic document examination that eventually enabled me to identify Anna Magdalena’s own handwriting and music calligraphy in manuscripts dating back to 1713 – seven years prior to the usually accepted date when Anna Magdalena and J. S. Bach first met. I realized finally that Anna Magdalena’s involvement was much deeper than usually believed. Finally, if we look at one of the earliest copies of the cello suites from 1727 or 1728, we see the words of the chamber musician Georg Heinrich Ludwig Schwanenberger on the title page. It says, in French, (“ecrite par Madame Bachen Son Epouse”), “Written by Mrs Bach His Wife.” That convinced me that Anna Magdalena was probably the composer. So who exactly was Anna Magdalena Bach? The evidence strongly suggests that she was a composition student of J.S. Bach. It is known that she was a trained musician, and that when she was employed at the Cöthen Court at the age of 20 she was the second most highly paid musician. Only Bach was paid more. This begs a number of questions, including why was she paid so highly and why has she not been recognized as a composer before? I hope I’ve left you with a tantalizing first course. Readers who wish to know more about Anna Magdalena will find answers to these and many more questions in my book. Professor Martin W. B. Jarvis, OAM, CM, Ph.D., FRSA, FIMT, is professor of music and head of the School of Creative Arts and Humanities at Charles Darwin University in Australia. There he teaches viola, violin and conducting. Prof. Jarvis also served as artistic director of the Darwin Symphony Orchestra for 20 years. E-mail him at Martin.Jarvis@cdu.edu.au.